Athens definitely stole my heart. I’ve never thought that I would love it as much as I did. I was completely overwhelmed by the history and beauty of the city. 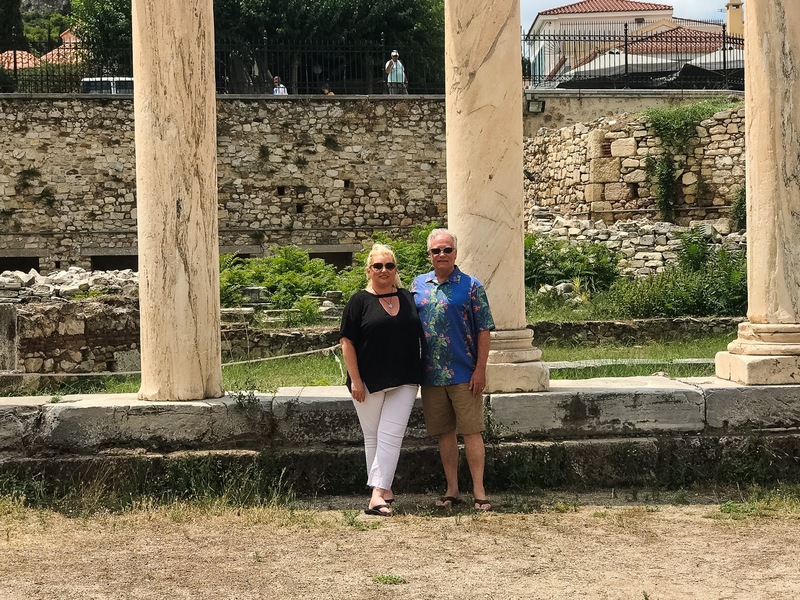 We spent a little over two days in Athens and loved each and every minute of it. 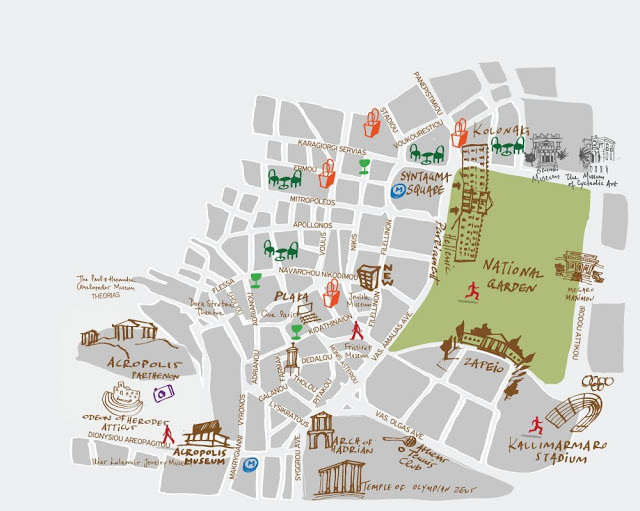 (This map was provided by New Hotel and helped us find our way around the city)Most of our time in Athens was spent visiting the archeological sites of the city. 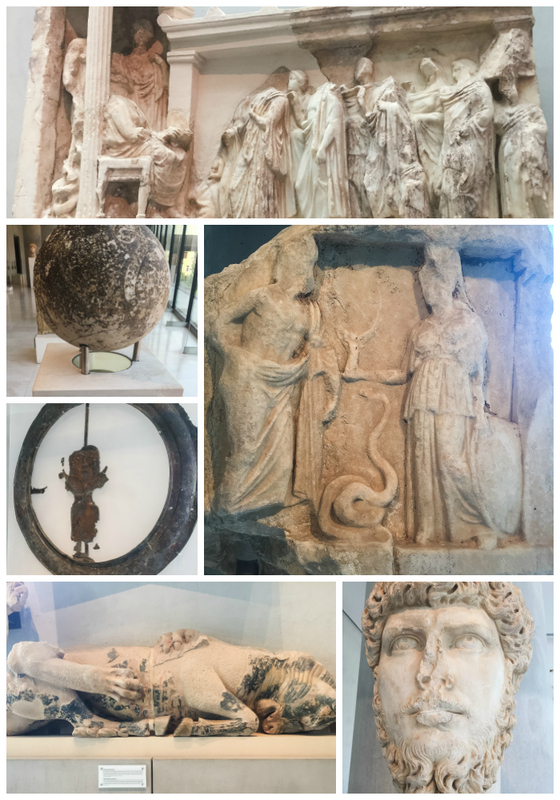 We actually spent most of one day touring the Acropolis and the Acropolis Museum. They were both absolutely amazing. The Acropolis Museum is made up of more than 4,000 finds from the excavation of the Acropolis and the surrounding area. 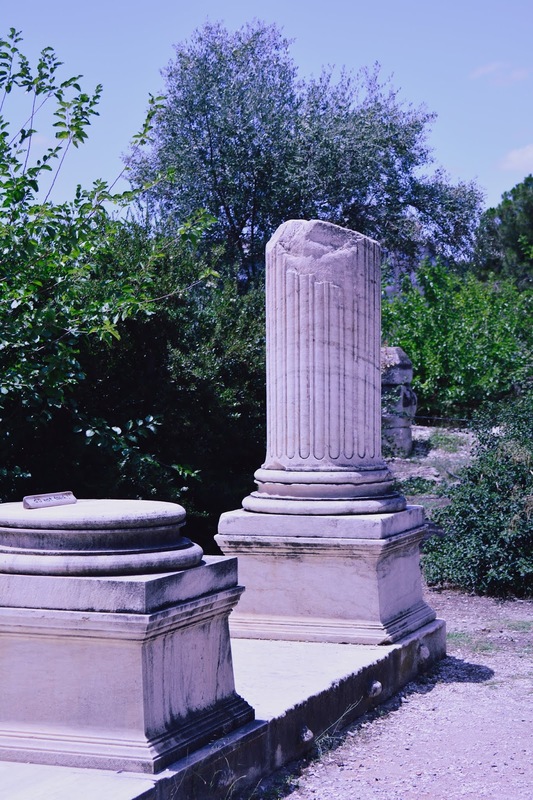 You will find things such as statues, pediments, busts, and pottery. 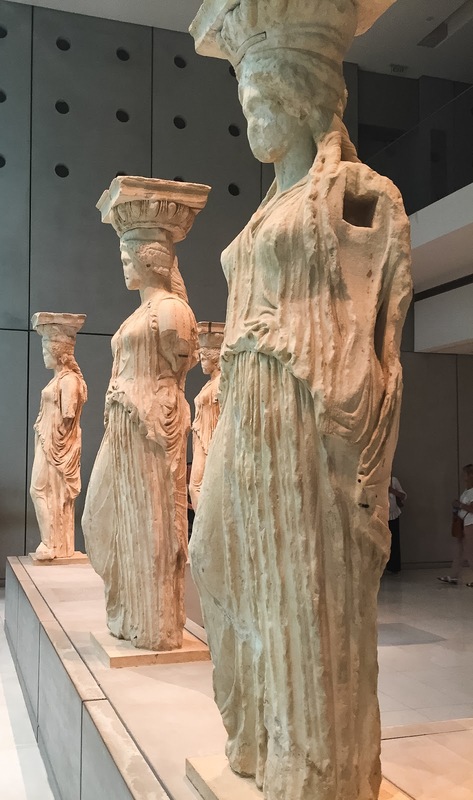 One of the highlights is that 5 of the 6 original Caryatids (Maidens) are located in this museum. Museum hint–The Museum doesn’t allow pictures to be taken on the first level, but you can shoot away once you are on the second level. There is a gift shop, restrooms, and cafe located on the first level close to the exit. 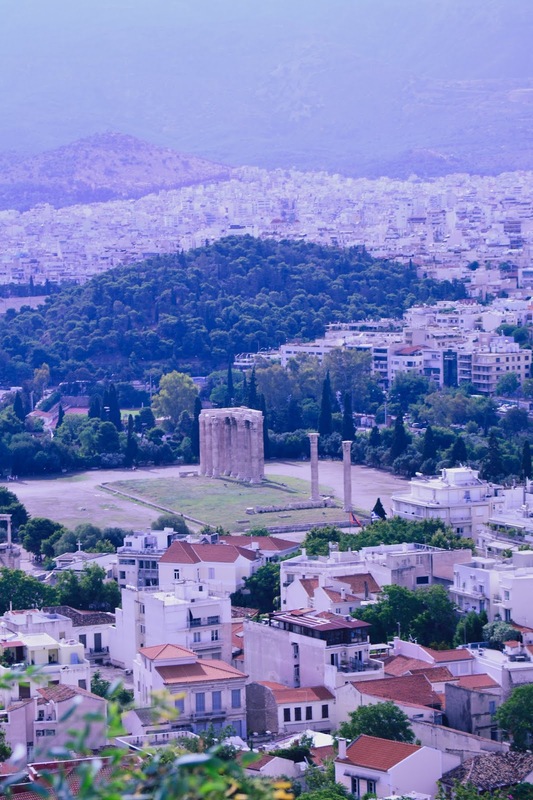 Most of the old city is located around Syntagma Square. This is where the famous “Changing of the Guards” happens in front of the Old Palace, where Parliment is housed today. The guards participate in a parade and ceremony daily. 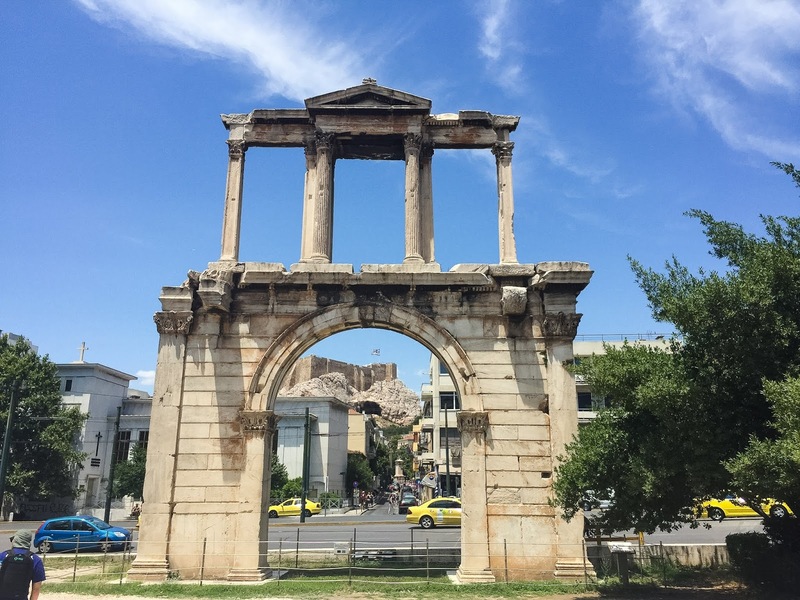 Just a quick walk from Syntagma Square is Hadrian’s Arch or Hadrian’s Gate and the Temple of Zeus, Olympian. These sites are located next to each other. 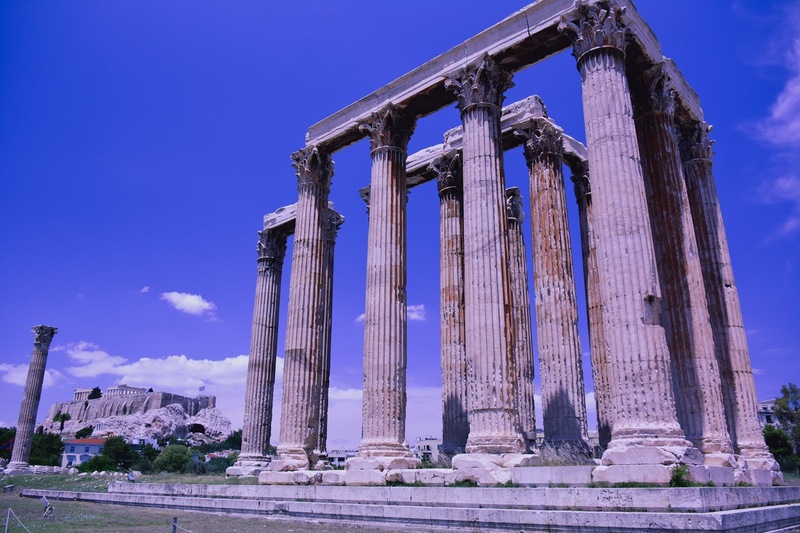 The Temple of Olympian Zeus is a temple constructed in honor of the Zeus. 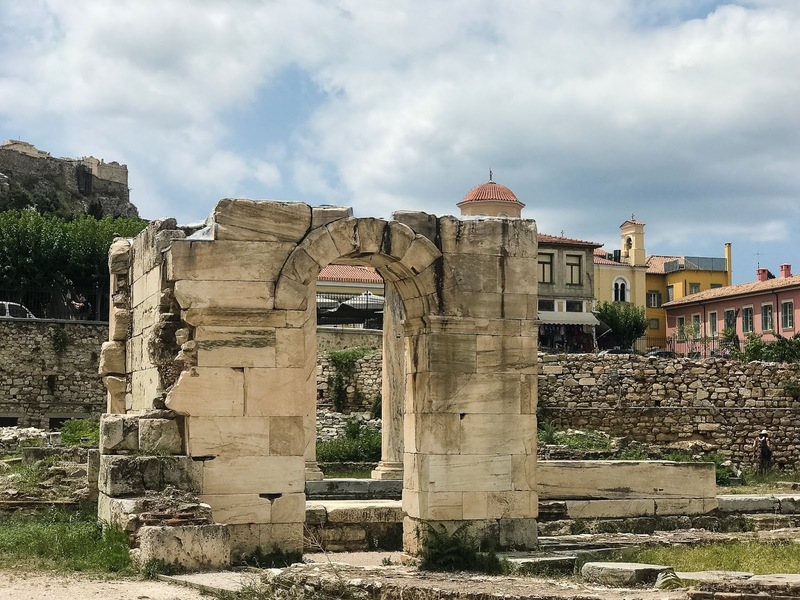 Construction was started in 6th century BC, but wasn’t completed until 2nd century AD. The temple, upon completion, was known as the largest temple in the world. 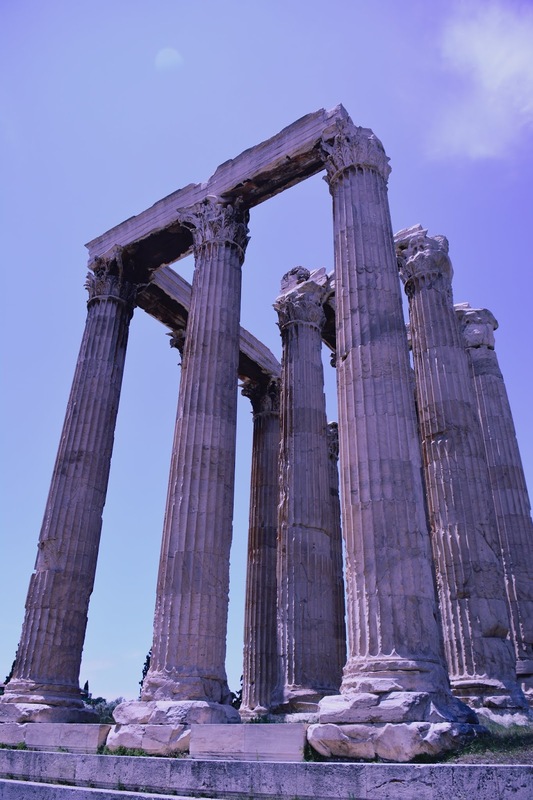 There were an astounding 104 original columns, however only 16 remain. 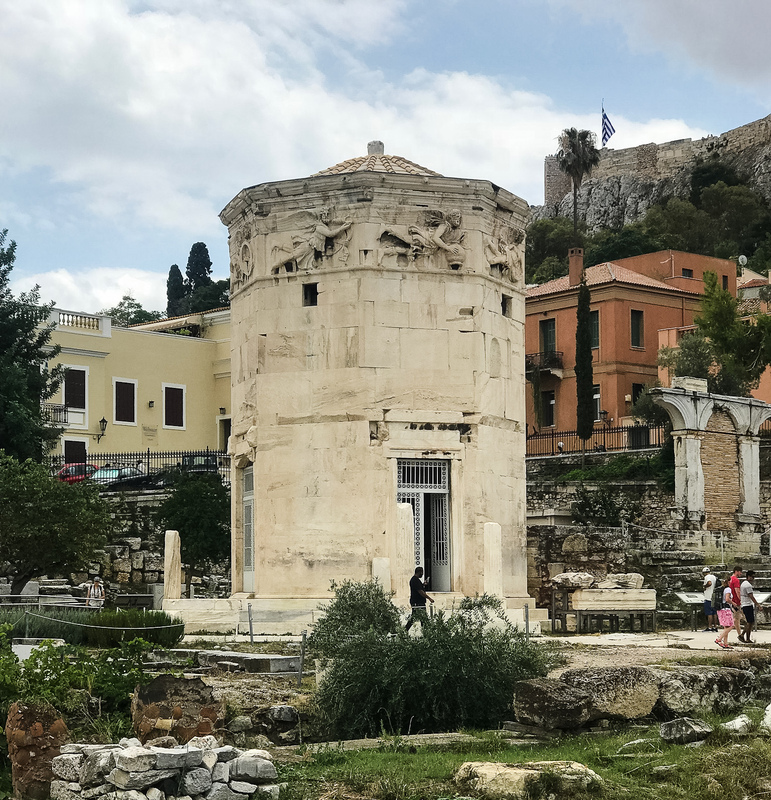 The neighborhood that we stayed in Athens was Plaka. You can read all about the hotel that we stayed in here. 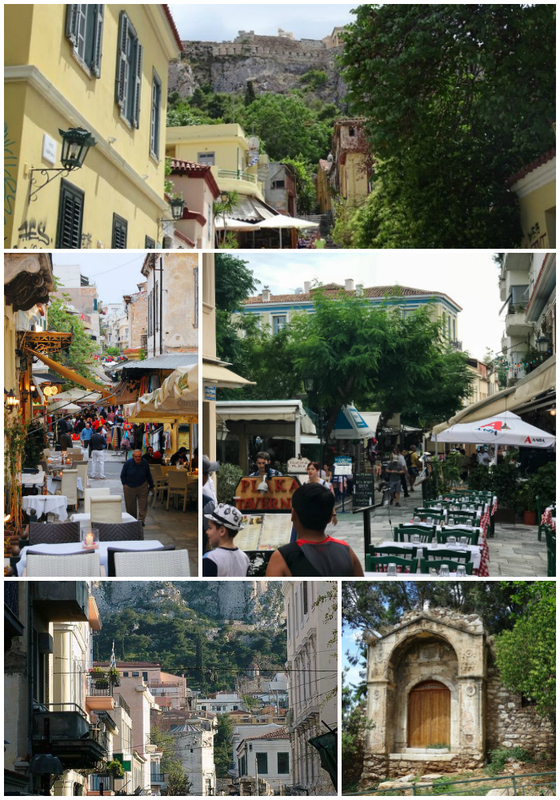 The meandering streets of Plaka are full of shops, restaurants, and plenty of historical sites. 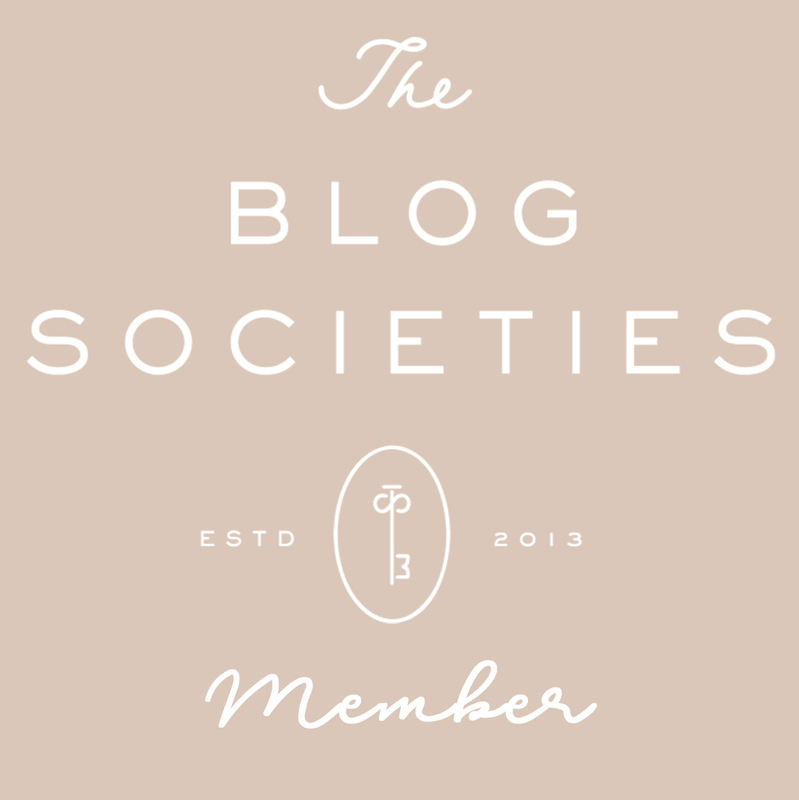 Plaka is known as the “Neighborhood of the Gods” due to being overlooked by the Acropolis. 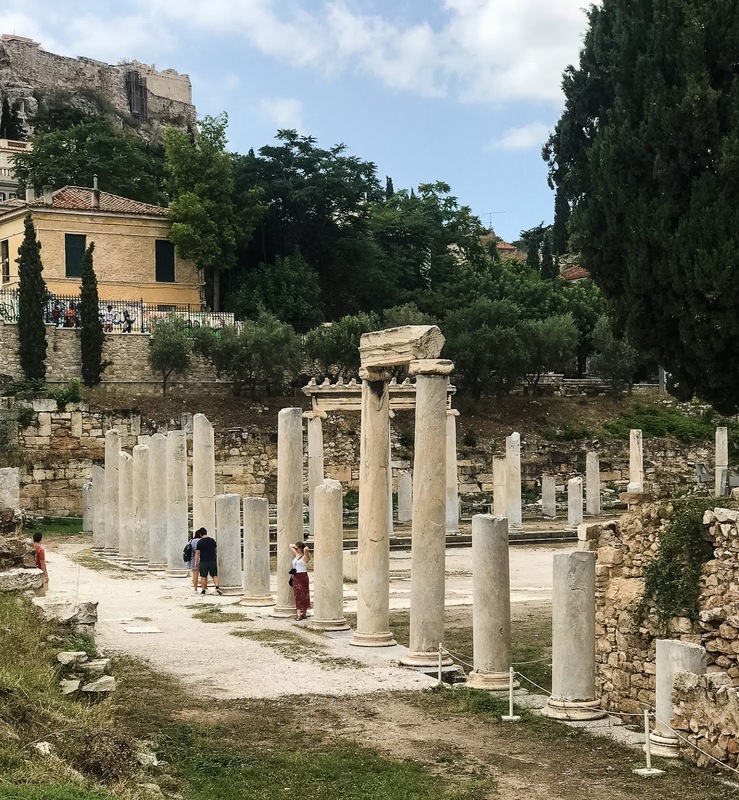 In the middle of Plaka are two well-known archeological sites- Hadrian’s Library and the Roman Agora. 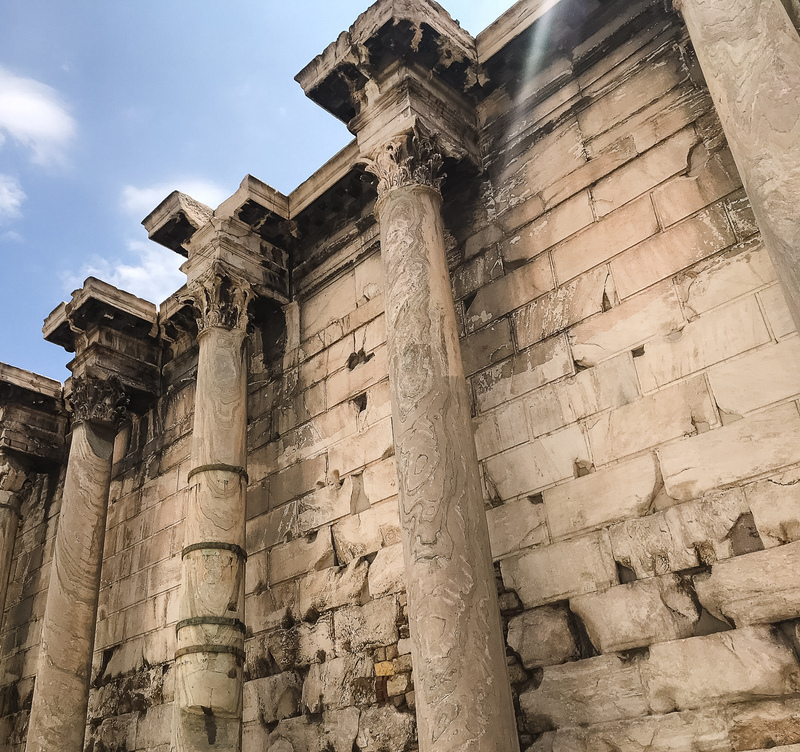 Hadrian’s Library was built is 162AD and utilized as a library for papyrus and a lecture hall. It was created by Roman Emperor Hadrian. 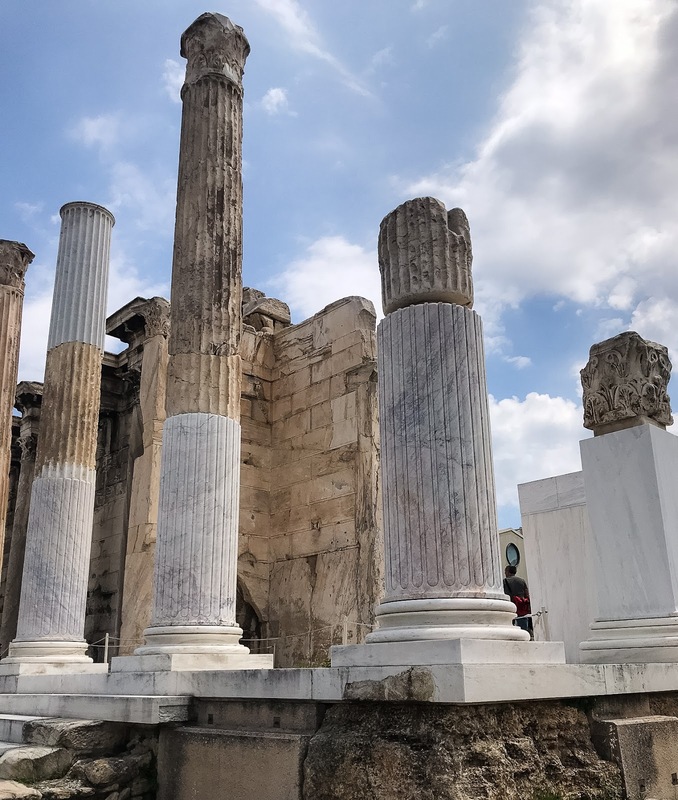 The Roman Agora was built around the time of 15 BC and was gifted to Athens by the Roman ancient family as a concert hall. 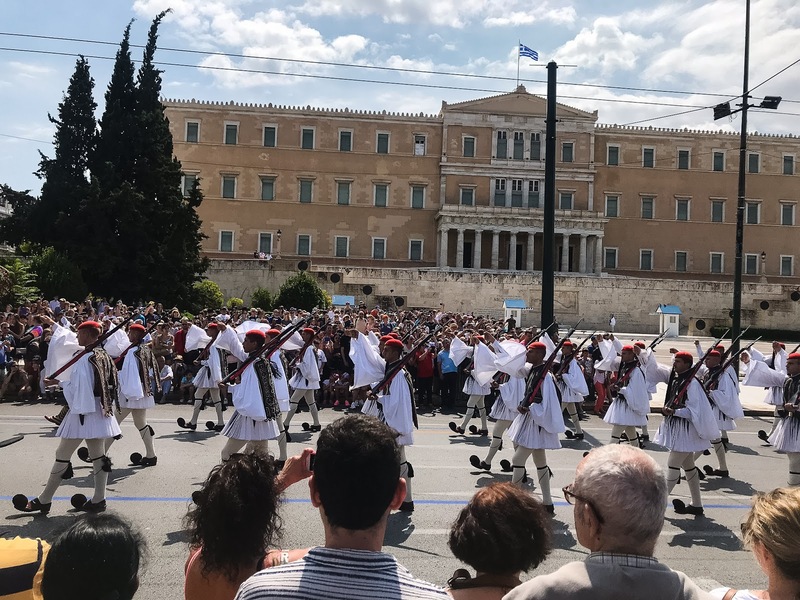 We thoroughly enjoyed every moment we had in Athens. The city, scenery, and people were absolutely fantastic. We can’t wait until next time.